Indians are crazy about Bollywood movies in India. If the movie is highly anticipated and has a big star, there is a frenzy to see the movie on the day it is released. The lines for getting the ticket to the movie are long and you have to wait a few hours before the show to get a good seat. Everyone has to see the movie the first day or they will not be able to sleep in peace. I am being sarcastic but it’s true. Due to the popularity of some Bollywood stars, their movie tickets are sold in the black market for 10-20 times the price of a ticket. And if you take the whole family of 4-6 people, good luck getting that many tickets. That is when you buy the tickets in the black market (usually from a guy who has connections to the clerk in the ticketing office and has bought a few tickets in advance). When you buy it for the whole family, you end up spending 10-20 times the cost of the ticket times 4 or 6 people! Talk about crazy! In case you are wondering, yes, I was one of the crazy people on occasions paying that much for a movie. This was, of course, when I used to live in India and I would look forward to the movies from a few of my favorite stars. Over the years, I have become very picky in the type of movies I watch – be it Bollywood or Hollywood. I usually look for movies that are different and have interesting stories and twists and turns. Over the years and especially since India opened it’s economy since 1991, not only has the quality of the Bollywood movies improved a lot but the directors have started experimenting with new and interesting themes. When you watch a Bollywood movie, they are usually 2 hours long along with song and dance sequences. They used to be 3 hours long! A Bollywood movie has to have a few song and dance sequences without which the movie may not run well even if it is an excellent movie. Every Bollywood movie has an intermission due to the length of the movie. The concession stands in the theaters in India usually have popcorn (both plain and spicy), various fried snacks like pakoda (see recipe) and samosa and the usual assortment of drinks, chai and ice creams etc. I used to look forward to the intermission to have the various snacks. To my pleasant surprise, I found I can get the various snacks even in the USA when I go to watch some Bollywood movies in the theaters during intermission. 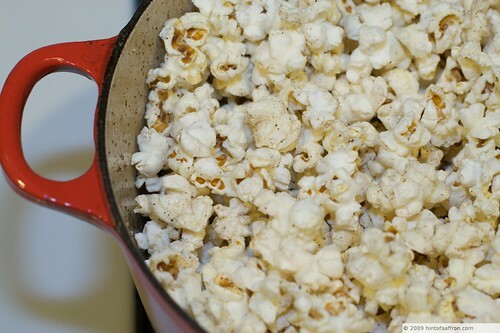 The idea of adding garam masala when making popcorn came from our friend and neighbor Patti. I got to taste the garam masala popcorn at Patti and Atul’s house and it was excellent. So I decided to try it out this weekend. It is an incredibly easy recipe to make. You can either make your own Garam Masala (which I prefer since it is incredibly fragrant as it is made from freshly roasted spices) or buy it from an Indian store. I have also suggested a link in the recipe below. I suggest you make your own garam masala (see recipe link below) and store it in an airtight container in a cool, dry place. It can be stored for 30-40 days and very easy to make. I sometimes like to have popcorn with cilantro and red onions. It’s a tasty variation. Of course, this is optional addition to the masala popcorn. Try it both ways and see if you like it. The garam masala gives it a very tasty variation to the traditional way you are used to eating popcorn. Heat ghee on medium-high heat in a medium saucepan (3 1/2 quarts). 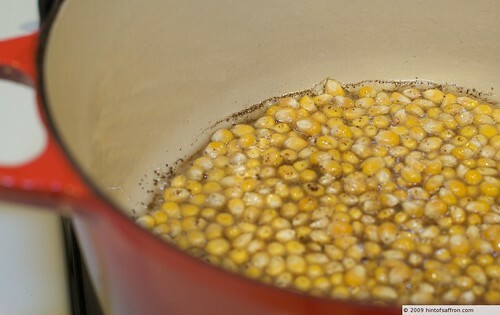 Add a single kernel of corn and cover the pan. 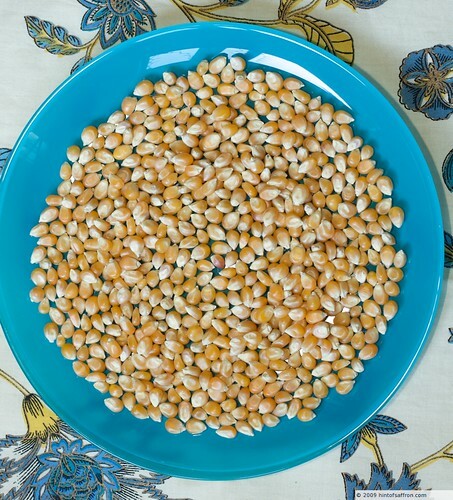 Once the kernel pops, add the garam masala, salt and stir and add enough corn kernels to cover bottom of pan one kernel deep. Cover the pan until popping subsides. After the popping has subsided, you will notice that some of the garam masala sticking to the sides of the pan. Just stir the popcorn scraping the masala from the side of the pan. Add ghee (or butter) as desired. It tastes excellent. 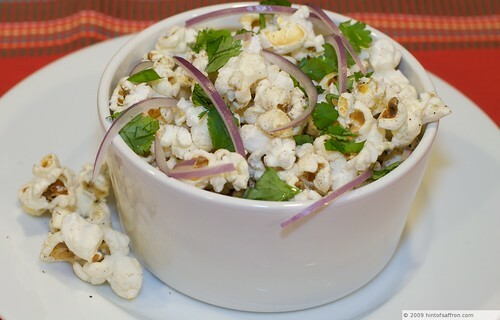 Optionally, you can also add cilantro and red onions to the popped corn.